...Emerson Pump Motors & Agriculture Solar Generators Powered Water Energy Increases Efficiency, Lowers Costs and Maintenance. We offer tailor-made solutions that work with you to create energy cost savings. Emerson Pump Motors and Agriculture Solar generators are dedicated to finding energy-efficient solutions for our customers and business partners. For over 50 years, Emerson Motors has strived to provide customers with the best value and reliability in industrial electric motors. That dedication shows in customer preference for Emerson pump motors. Emerson Motors for Pumps introduces its line of pump motors. Our highly engineered pump motor combined with Agriculture Solar's generators are a simple low-cost product with integrated control, Emerson Pump Motors is an ideal solution, is exceptionally easy to use, and incorporates pump management. 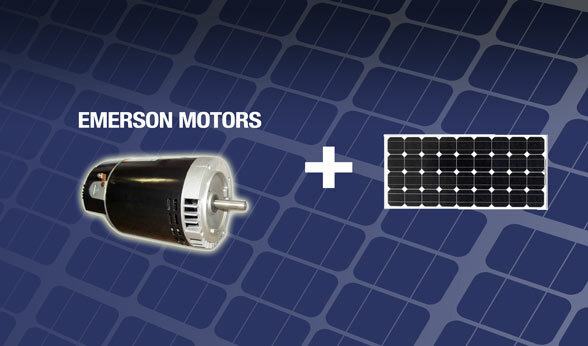 Emerson Pump Motors reduces the costs in the pumping application. Agriculture Solar adapts the electrical power consumption to the needs of the application and hence results in energy savings. Emerson Motors and Agriculture Solar together leads the way in helping customers save money in pump applications by using energy efficient designs. Emerson Pump Motors and Agriculture Solar Generators provide premium efficiency and are designed as standard to be invertor ready with wide variable torque speed ranges. Today’s line of Emerson Pump motors offers customers some from the highest levels of efficiencies, in ratings from fractional to 750 kW. Emerson has ratings available immediately from stock, with non-stock motors with the industry’s shortest load times. At Agriculture Solar, Emerson Pumps and Agriculture Energies can be your simple water pump solution for off the grid. Agriculture Energies systems have been dedicated to modern agricultural irrigation and successfully active in the top irrigation fields for over 10 years and continues to bring the tried and true principles and advantages of solar hybrid power. Think about it, and then make your move. Let Emerson Pump Motors and Agriculture Solar water management provide you with decades of reliability and lasting value. We invite you to explore the possibilities of our reliable hybrid solar powered pump solutions.